The Ghana Boxing Authority (GBA) has ordered a re-match between national super lightweight champion, Moro Tijani, and Isaac Quartey. The authority arrived at the decision last Wednesday, following their review of the fight and scrutiny of the fight report as submitted by the fight commissioner. 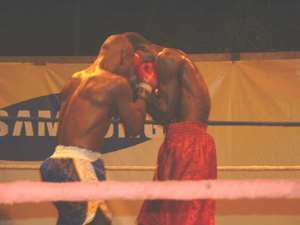 Tijani won the national championship fight by a unanimous verdict on February 28 at the Kaneshie Sports Complex, but walked away with the title amidst boos and abuses by fans. According to GBA Vice-Chairman, Moses Foh-Amoaning, the authority has mandated the rematch to take place within 60 days from the date of the decision.In its ruling, he said the authority did not find any error on the score cards of the judges and neither did it find that the decision was procured by fraud. The authority did not also find the fight result “manifestly bad as to bring the name of the sport into disrepute”.But it upheld that the verdict did not meet the expectation and, therefore, ordered a re-match to settle the dispute.Tijani's victory in the fight and the title, however, remain intact. Quartey cut the champion in the second round and floored him in the eighth and ninth rounds too in the fight that attracted huge controversy after the verdict was announced. The GBA Sanctioning Committee Chairman, Samir Captan, caused an announcement to the effect that the verdict would be reviewed by the authority, but the announcement met the displeasure of the fight judges and referees who threatened to boycott the last bout. Mr Foh-Amoaning said his outfit was working out a number of refresher clinics for referees and judges in view of the high number of controversial decisions they had handed in recent times. Italian boxing referee, Sergio Silvi, who refereed the WBC International featherweight title fight when Osumanu Akaba knocked out Malik Jabir at the Accra Stadium on Indepedence Day, ran a course for his Ghanaian counterparts before leaving, and Mr Foh-Amoaning said it was one of programmes adopted by the authority to re-organise Ghanaian fight referees and judges. This programme, he said, included a policy to continuously retrain the referees and judges to bring them to international standards.